\*This book was previously published as One Summer. A heartwarming read with just enough depth. Alice Emerson is devastated after losing her beloved grandfather. At the same time, her relationship comes to a crashing halt. She is due for a change, and so is her lifelong friend Sasha. The two of them decide to leave the city and head to the beaches of the Outer-Banks, hoping for a fresh new start. Not only does Alice need this change, she hopes it will be good for her son Henry. Due to her broken relationship, she is shocked to find herself drawn to Jack Murphy, who is visiting in town with his father. With the little time he has available, they manage to find themselves quite comfortable in each other's company. Meanwhile, since Alice inherited her grandfather's bike shop, her move gives her the opportunity to create a business for herself. With Sasha's help, she sets out to open an ice cream shop there. Happy as a clam at first, things change when she runs across a letter that ultimately turns her life upside down. Then, the dynamic changes between Alice and Jack. I love Alice. She is a kind, thoughtful friend, and a wonderful and sensitive mom to Henry. The rest of the characters, Sasha, Jack, Butch and Melly are equally wonderful. One Summer is a sensitive, heartwarming read; a true, feel-good story that had just enough depth to keep me turning the pages. Many thanks to Bookouture and to NetGalley for this ARC to review. 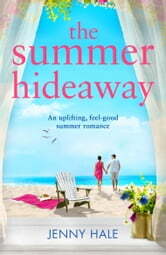 I received a copy of this story from NetGalley for a honest review This is my first Jenny Hale book and its a good beach read. This story is about friendship and making a new start. Alice has inherited a building from grandfather and she decides to pack up and move to open up an ice cream shop, her best friends decides to join her. This story is cute and quite sweet, I wish we got Jack's pov it would have made the story stronger for me but overall I enjoyed how the story played out. It was a lovely summer read with a lot of descriptions, so it made you feel as if you were there as well. Some things were maybe a bit to good to be true, but hey, it's a book and not real life and books are made for dreams to come true, aren't they? If you are somewhere on a beach as well or if you are enjoying the sun elsewhere or maybe you keep the book for reading while there is a storm outside, I am sure you will enjoy it if you like to read about romance, friendship and family with all the ups and downs that they bring. Thank you, Jenny Hale, Bookouture and Netgalley.